November 9, 2017 – Escanaba Public Library (Escanaba, MI). AND HERE: 100 Years of Upper Peninsula Writing, 1917-2017 (Michigan State University Press, 2017). Author reading, panel discussion and book signing featuring anthology contributors Kathleen M. Heideman, L.E. Kimball, April Lindala, Jillena Rose and Eric Torgersen. November 2, 2017 – Michigan Technological University’s J. Robert Van Pelt and John and Ruanne Opie Library (Houghton, MI). Reading, Q&A, and book signing featuring Ellen Airgood, Sally Brunk, Kathleen M. Heideman, and Jillena Rose. This event promotes authors featured in anthologies from Michigan State University Press –– HERE: Women Writing on Michigan’s Upper Peninsula; and AND HERE: 100 Years of Upper Peninsula Writing, 1917-2017. October 18, 2017 – Ishpeming Public Library (Ishpeming, MI). Poetry reading featuring authors from MAIDEN VOYAGE: Marquette Poets Circle Anthology (Gordon Publications, 2017). October 16, 2017 – Peter White Public Library (Marquette, MI). “World Book Launch” poetry reading gala event, featuring 30+ authors from MAIDEN VOYAGE: Marquette Poets Circle Anthology (Gordon Publications, 2017). August 16, 2017 – Negaunee Public Library (Negaunee, MI). AND HERE: 100 Years of Upper Peninsula Writing, 1917-2017 (Michigan State University Press, 2017). Reading featuring anthology contributors Shirley Brozzo, Kathleen M. Heideman, Sanara Petrouske, and M. Bartley Seigel. August 16, 2017 – Falling Rock Cafe and Bookstore (Munising, MI). AND HERE: 100 Years of Upper Peninsula Writing, 1917-2017 (Michigan State University Press, 2017). Book signing with anthology contributors Eric Gadzinski, Kathleen M. Heideman, L. E. Kimball, Rosalie Sanara Petrouske, and M. Bartley Seigel. August 16, 2017 – Munising Public Library (Munising, MI). AND HERE: 100 Years of Upper Peninsula Writing, 1917-2017 (Michigan State University Press, 2017). Reading and book signing featuring anthology contributors Eric Gadzinski, Kathleen M. Heideman, L. E. Kimball, Rosalie Sanara Petrouske, and M. Bartley Seigel. Wednesday March 22, 2017 6-8pm: Inspired by paintings and photographs of the Wildcat Canyon Creek and Mulligan Creek wetlands, WETLANDS INTO WORDS features a a poetry reading paired with a slideshow of artwork from the WETLANDS exhibition, on view in the Huron Mountain Club Gallery of the Peter White Public Library. Poets include Milton Bates, Rochelle Dale, Lynn Domina, Amber Rose Edmondson, Kathleen M. Heideman, Janeen Rastall, Christine Saari and Russell Thorburn. Artists featured in the WETLANDS exhibition include: Michele Tuccini, Kathleen Mooney, Gail Mahan, Thane Padilla, Julie Mowen, Susan Roubal, Catherine Brunet, Amy Cherrette, Kathleen M. Heideman, and Jeremiah Eagle Eye. 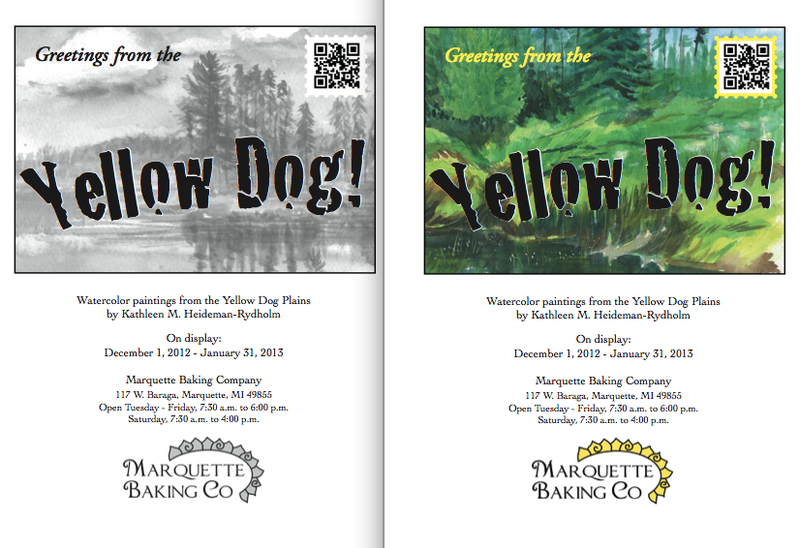 “Greetings from the Yellow Dog!” — Recent watercolors from the Yellow Dog Plains by Kathleen M. Heideman-Rydholm will be on display on the ground floor of Ore Dock Brewing Company during the month of March 2014. Hours: Noon – 11 pm, Tuesday-Wednesday | Noon – Midnight, Thursday-Saturday | Noon – 11 pm, Sunday. Ore Dock Brewing Company, 114 Spring St., Marquette MI 49855. In conjunction with Wisconsin Lutheran College’s popular Fine Arts Summer Arts in the Park concerts, Schlueter Art Gallery will host an art exhibit celebrating the work of U.S. National Park Artists in Residence. Artists, along with writers and poets, have played a major historical role in establishing national parks, inspiring Congress and the public to protect the unique and diverse landscapes of America because of their art. Artists continue the tradition today. Over 29 national parks, monuments and wildlife refuges select and host artists each year to make artworks reflecting the special qualities of each place and their individual response from a contemporary, current perspective. Wisconsin Lutheran College Schlueter Art Gallery is privileged to host a sampling of past artists in residence including Diane Bywaters, Kathleen M. Heideman, Kathy Hodge, Geri Schrab and Wisconsin Lutheran College art professor Kristin Gjerdset. Schlueter Art Gallery, Wisconsin Lutheran College, 8815 W. Wisconsin Avenue, Milwaukee, WI 53226. Summer Gallery Hours: M-F 9 am – 4 pm plus Saturday July 6 from 9 am – 5 pm; Opening Reception on July 12, 4-7 pm. Poet Kathleen M. Heideman will offer a poetry reading and slide lecture on her work as a visiting writer at Marian University in Fond du Lac, on Tuesday April 26, 7 PM. This event is free and open to the public, and will take place in the Stayer Center Auditorium at Marian University. Kathleen M. Heideman has been named a 2011 resident fellow of The Helene Wurlitzer Foundation of New Mexico. She will receive an extended artist residency in Taos, from late January-late April of 2011. The Helene Wurlitzer Foundation of New Mexico is located on eighteen acres in the heart of Taos, New Mexico. Heideman served as Artist-in-Residence at the Necedah National Wildlife Refuge in October, 2010 — her first creative project with the U. S. Fish and Wildlife Service. Heideman received a Spring 2010 Andrews Forest Writer’s Residency. Her week-long residency took place in early May, at the H. J. Andrews Experimental Forest research station, in the Willamette National Forest of Oregon. Andrews Forest residencies are administered by Oregon State University’s Spring Creek Project for Ideas, Nature and the Written Word, which seeks to “bring together the practical wisdom of the environmental sciences, the clarity of philosophical analysis, and the creative, expressive power of the written word, to find new ways to understand and re-imagine our relation to the natural world.” Andrews Forest Residencies are awarded to writers “whose work in any genre reflects a keen awareness of the natural world and an appreciation for both scientific and literary ways of knowing.” Previous residents at Andrews Forest have included authors Scott Russell Sanders and Pattiann Rogers. The National Science Foundation designated the Andrews Experimental Forest a Long-Term Ecological Research (LTER) site — one of 26 LTER sites administered by the US, including research sites in the Arctic and on Antarctica, where scientists conduct research projects designed to span human generations, gathering data and insights for hundreds of years. Like the NSF’s Long-Term Ecological Research program on which it is modeled, the Long-Term Ecological Reflections project will gather a long-term record of changing creative responses to an ever-changing landscape. For two hundred years, 2003-2203, writers-in-residence will be encouraged to visit key LTER sites in the forest, to create an ongoing log of their reflections. These writings will be gathered in permanent archives at Oregon State University. The mission of the Long-Term Ecological Reflections program is to bring together writers, humanists and scientists to create a living, growing record of how we understand the forest and the relation of people to the forest, as that understanding and that forest both change over time. Kathleen M. Heideman spent March 2010 as Artist-in-Resident at Badlands National Park — Heideman’s sixth artist residency with the National Parks. Her Badlands project — A Book Made of Soil — combines poetry, geology, paleontology, GPS data, and landscape sketches. During the Badlands residency, Heideman worked with local students, through a National Park Service educational outreach program. She is working on a new collection of poetry, tentatively titled Department of the Interior.